Once assessment results have been uploaded into SchoolCity Suite through file upload, scanning, GradeCam™, or online administration, the data can be viewed in a variety of ways. 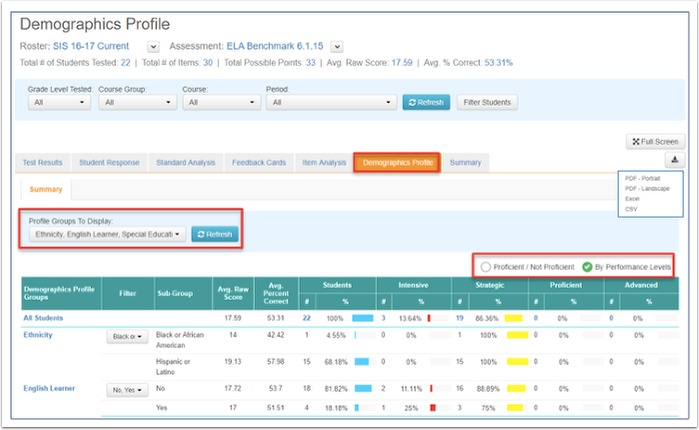 One of the Predefined Reports in SchoolCity Suite is the Demographics Profile which displays assessment data by demographic group of the test takers for the selected assessment. Results may be viewed by Performance Levels or by Proficient/Not Proficient. In the Report Manager, the list of Predefined Reports will show underneath the Predefined tab. Click on the Demographics Profile name in blue or on the view icon (eye) to the far right to go to the Demographics Profile report. Note the descriptor statement for this report. Or, from the Launchpad, click on the REPORTS flip card. On the flipped side, select Predefined Reports, then click on the right arrow to scroll to the next card. Select Demographics Profile to go to the report. Search Filters: Types depend on User role. 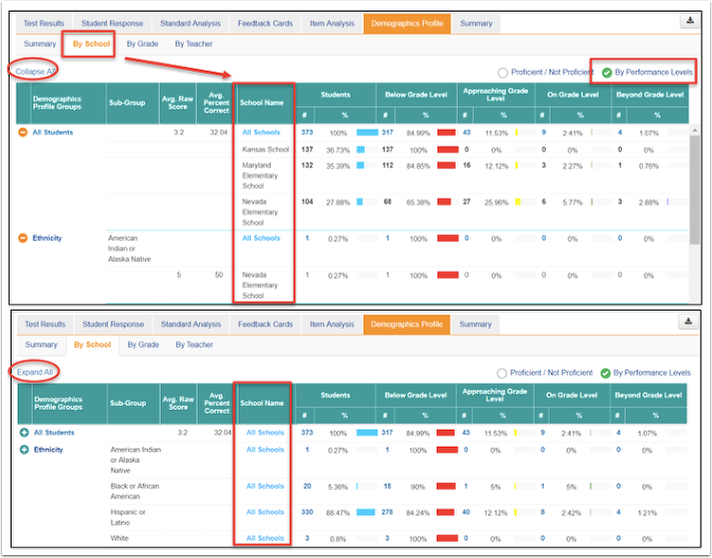 Views: Summary (All User Roles), By School (District User), By Grade (District and School Users), By Teacher (District and School Users). Click Refresh to view results. Full Screen: Click here to view the report full screen. Profile Groups to Display: Use the drop down menus to select one or more demographics. (Options will vary depending on district Student Information System.) Click Refresh to view results. By Proficient/Not Proficient OR By Performance Levels: Proficient/Not Proficient threshold determined by the Standards Mastery Threshold and color coding are set in District Defaults or My Preferences. 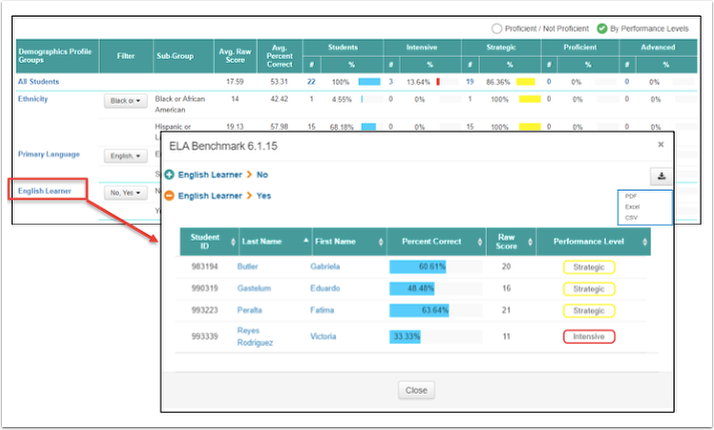 Performance Level descriptors, cut point or percentages, and color coding are set by the assessment creator and/or district template. Each will vary from what is shown. View Students: For Teacher Users, click on the demographic to view the list of students in that group. Summary: By Proficient/Not Proficient: (Teacher User) Profile groups, Filter, Sub-Group, Average Raw Score, Average Percent Correct, Students (Number and Percent-blue bar graph), Proficient (Number and Percent-green bar graph), Not Proficient (Number and Percent-red bar graph). By School: By Performance Levels: Note the addition of the column, School Name. Collapse All/Expand All: The default view is to show all data points. To close all data points, click on Collapse All; open all data points by clicking on Expand All. You can also close and open one data point at a time by clicking on the orange circles to close, and on the green circles to open. By Grade: By Performance Levels: Note the addition of the column, Grade Name. A comparison of All Grades (if more than one have taken the same assessment) and the selected grade will be shown. By Teacher: By Performance Levels: Note the addition of the column, Teacher Name. 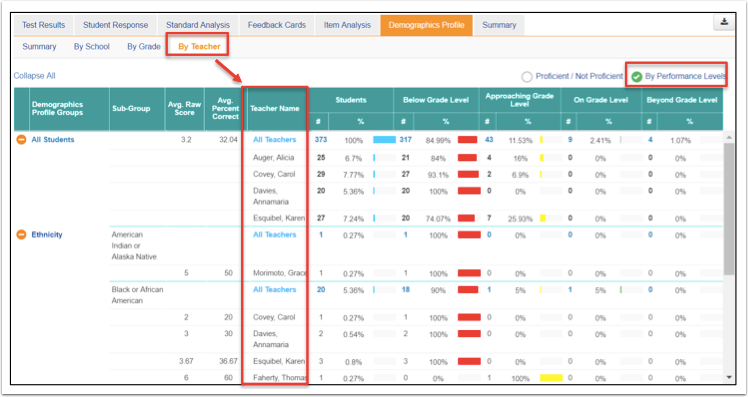 View Students: For Teacher Level Users, students in each demographic group may be viewed. Click on a demographic group title in blue font. Open the list by clicking on the green circle with a plus sign. Close by clicking on the orange circle with a minus sign. View student data Student ID, Last Name, First Name, Percent Correct, Raw Score, and Performance Level. Download to PDF, Excel, CSV.